- Delivery: The LCN 4040XP Hw/PA is In Stock and available to ship. 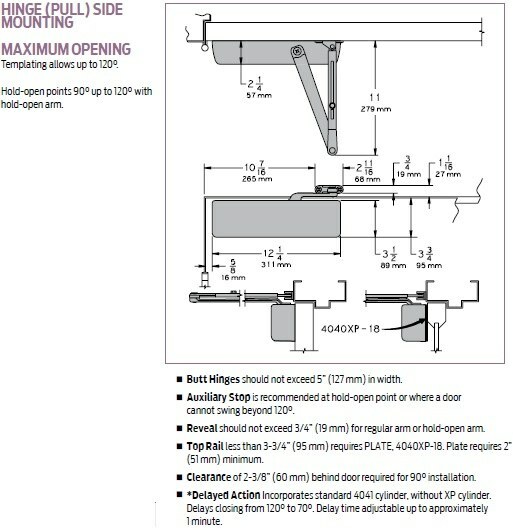 Rw/PA (Regular Arm 4040XP-3077): Non-handed arm mounts hinge side or top jamb. Includes PA SHOE for parallel arm mounting. 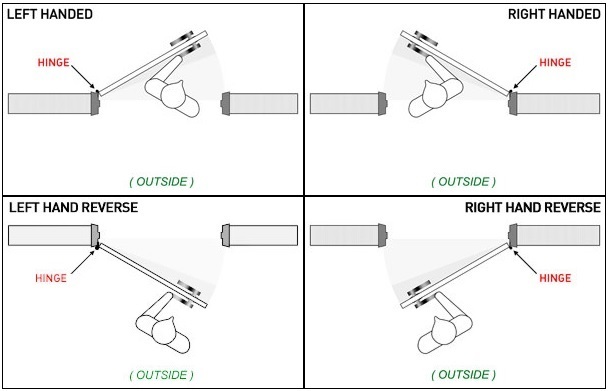 Hw/PA (Hold-Open Arm 4040XP-3049): Optional, non-handed arm mounts hinge side, top jamb or parallel arm. Hold-open adjustable at shoe. EDA (Extra Duty Arm 4040XP-3077EDA): Non-handed parallel arm features forged, solid steel main and forearm for potentially abusive installations. CUSH (Cush-N-Stop Arm 4040XP-3077CNS): Non-handed parallel arm features solid forged steel main arm and forearm with built-in stop in soffit shoe. 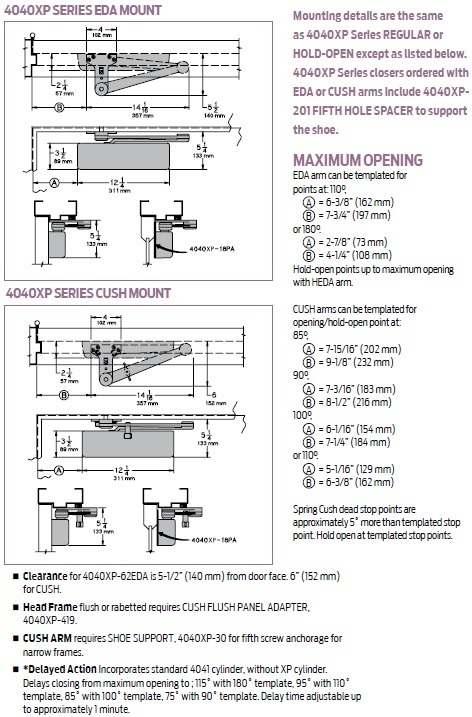 HCUSH (Hold-Open Cush-N-Stop Arm 4040XP-3049CNS): Non-handed arm provides hold-open function with templated stop/hold-open points. Handle controls hold-open function. 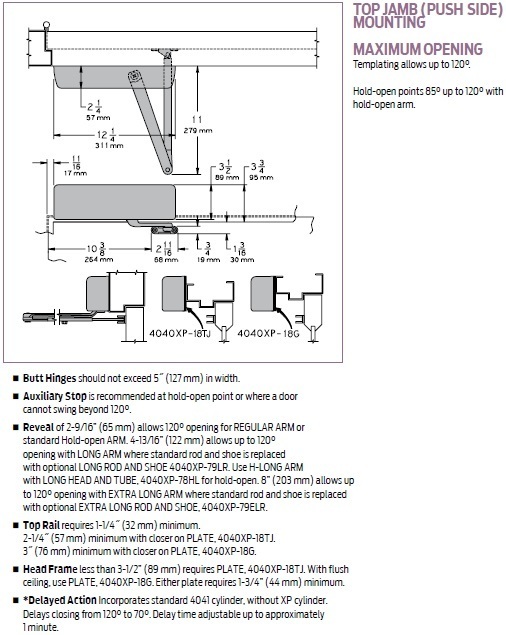 SCUSH (Spring Cush-N-Stop Arm 4040XP-3077SCNS): Optional, non-handed parallel arm for abusive applications features solid forged steel main arm and forearm with spring loaded stop in the soffit shoe. 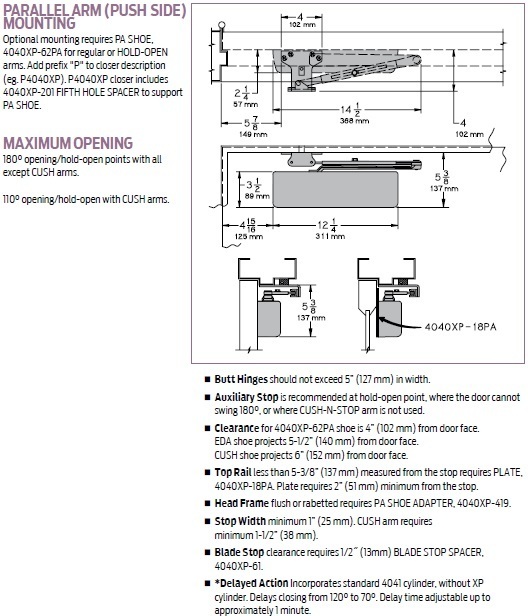 SHCUSH (Spring Hold-Open Cush-N-Stop Arm 4040XP-3049SNCS): Optional, non-handed parallel arm for abusive applications features solid forged steel main arm and forearm with spring loaded stop in the soffit shoe. Handle controls hold-open function.